"Sincerus Capital brings high potential Canadian real estate investment opportunities with integrity, proficiency, and transparency to clients. These values govern all of our practices within the organization." Sincerus Capital brings high potential Canadian real estate investment opportunities with integrity, proficiency, and transparency to clients. These values govern all of our practices within the organization. We value your trust in us, and we understand the importance of managing your financial assets with prudence and care. We understand that every investment decision depends on having trust as the foundation. This trust is developed and fostered through our commitment to act with integrity. Aligning management interests with those of our investors through performance based incentives. 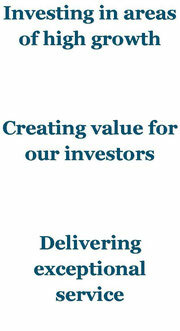 Ensuring that investors receive profits before we do. Exercising prudence and care with our investors' financial assets and managing our costs. We take pride in our ability to source quality real estate investment opportunities that have the potential to provide investors with meaningful returns. Members of the Sincerus management team have extensive experience and proven success in creating value with real estate. All team members directly involved in our real estate portfolio are experts in their respective field. Financial records and details are handled with care, and regularly confirmed for accuracy. Investors need to have confidence that they can ask questions and receive answers in order to make an informed investment decision. Sincerus Capital believes that being transparent with all information develops trust, and fosters a long-term and mutually beneficial relationship. Disclosing complete information on our real estate investment properties. This is not intended to be an offering of securities. Offerings in Sincerus projects are made only to those investors in jurisdictions of Canada who meet certain eligibility or minimum purchase requirements pursuant to NI 45-106. The risks of investing are outlined and detailed in the form of an offering memorandum prescribed by NI 45-106 and you should review the offering memorandum in detail prior to investing. Investments are not guaranteed or insured and the value of units may fluctuate. See the applicable offering memorandum for complete details.